In November many of the specialist food producers have open days, inviting their regular customers and the general public to come to the farm. It's a way of promoting the newly available produce from this year's harvest. 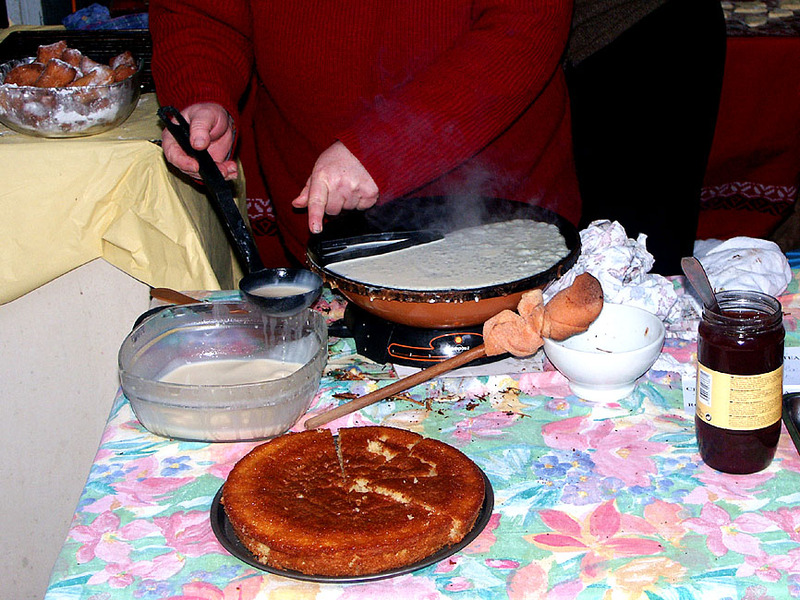 The event will generally consist of a produce market, with a variety of other producers from the region taking a stall; there is usually le possibilité de repas (a sit down lunch available) and sometimes a display of old farm vehicles or farm animals (unusual breeds of chickens and rabbits are a favourite). 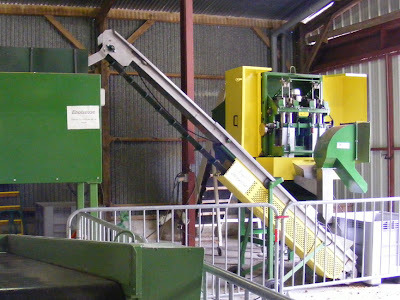 We have previously been one on a walnut oil producing farm, and we also went to one on the weekend at Domaine de la Rablais, a vineyard run by the Simoneau family, who we have visited a couple of times before. 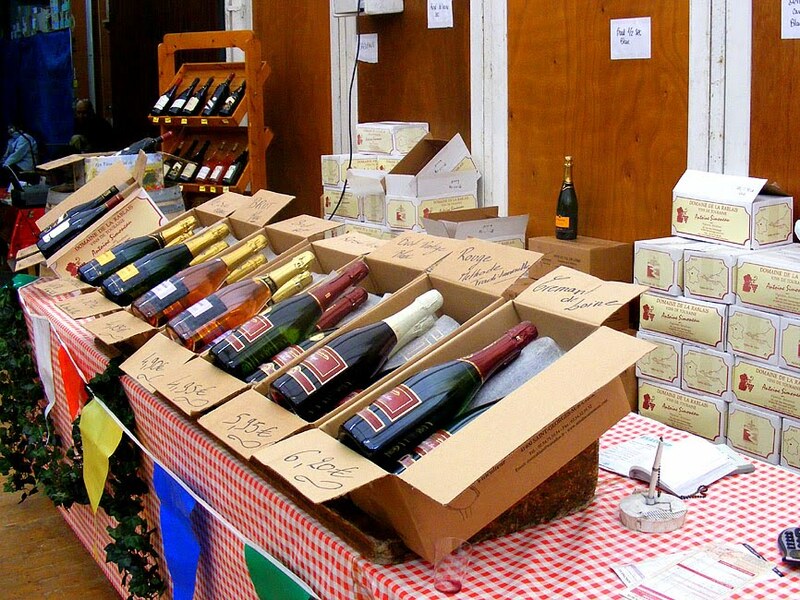 Boxes of sparkling wine for sale. The market at the Simoneau's open day was small, but the quality of the displays and produce was particularly good. We bought some extremely good boudin blanc (chicken sausage) from Aux Charcuteries Gourmandes; a très sec (very dry ie. aged) log of goats' cheese; half a kilo of châtaignes (chestnuts), which we will cook in the ash tray of our wood stove; 3kg of very fresh oysters from somewhere on the Poitou-Charentes coast to the west for 10€; a couple of crêpes to snack on; and of course, a case of wine (35€ for a mixed case of 6 bottles of sparkling wine). 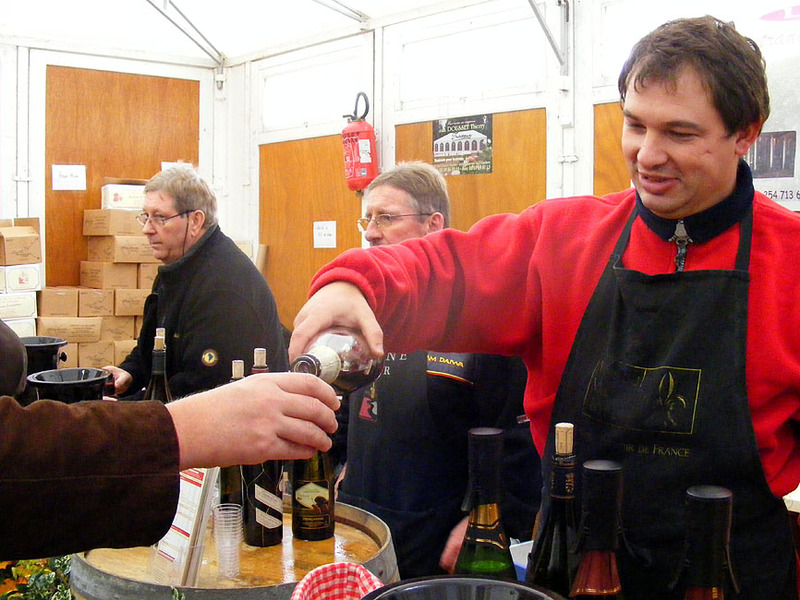 Sampling the wine before buying. A nifty tool for getting that perfect thin lacy crêpe. We were fairly restrained with the wine. Most people were buying multiple cases and staggering out to the carpark with them on sack trucks and trolleys. Some people were buying en vrac (in bulk), the wine being squirted directly from the stainless steel vats into their plastic jerrycans like filling an emergency petrol can. 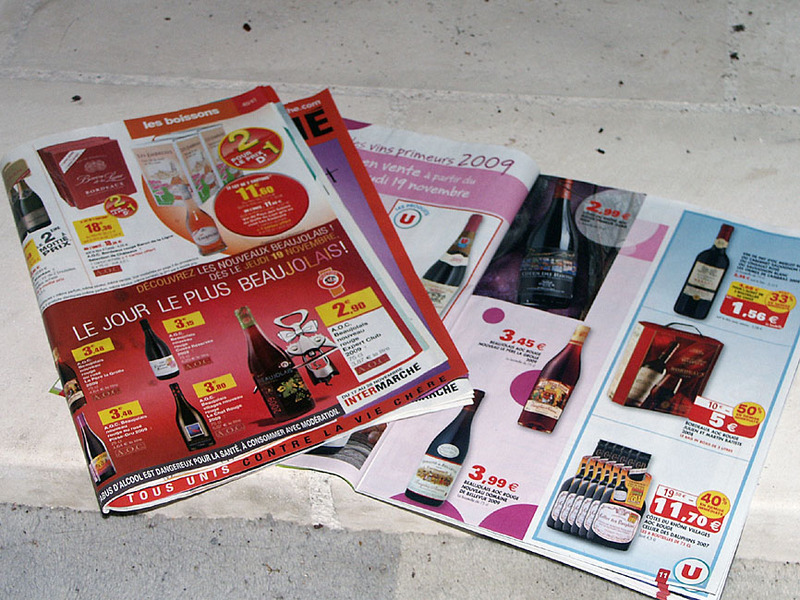 The cheapest was 1,35€ / litre for Rosé de Loire. This year the water levels in the river have been all over the place - with no discernable reason. 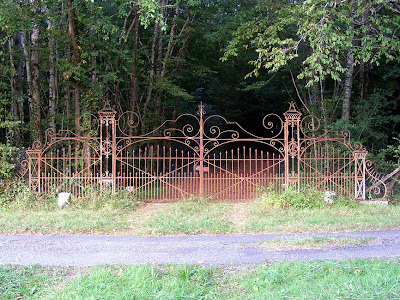 After laying the dalles gazon, our next task was to hang the gates. When we were putting the gateposts into the ground we spent a lot of time measuring, to make sure the gateposts were the right distance apart, and that the gates would be level once installed. Once we had decided on where the posts should go I measured again, and just for good measure (as it were) I measured again once the posts were in but before the cement had set. 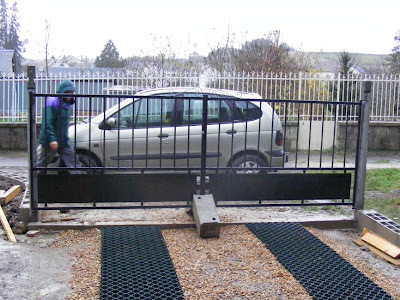 I had to design and manufacture my own method of hanging the gates as the hinges supplied with the gate were the sort that are meant to be hammered into stone, not the sort that screw or bolt into cement. In the end we decided on the bottom hinge being a solid cast metal shutter pin screwed into the posts taking all the weight, and as all the top hinge has to do is hold the gate in place I would bolt a bent metal strip to the post and use the original gate fitting to locate a bolt into the gate. By the time we were ready to start, the weather had turned nasty and we were getting rained on. Even though this made precise work even more difficult, we managed to get all the parts level and even. This involved drilling a couple of new holes in the posts, but even this went surprisingly well (I don't really like using electrical power tools outside in the rain, but no way was I stopping work halfway through). 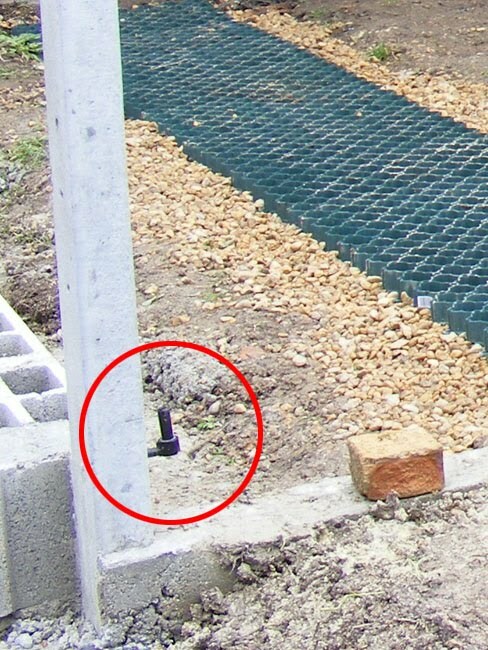 The custom gate fixing method went onto the posts easily enough, and even 2 days later appears to be really solid. The gates swing freely, but are so level that they don't swing open (or closed) under their own steam. This is a victory, and we were feeling well chuffed. Attaching the top fitting to the post. It was then we realised we had a problem. 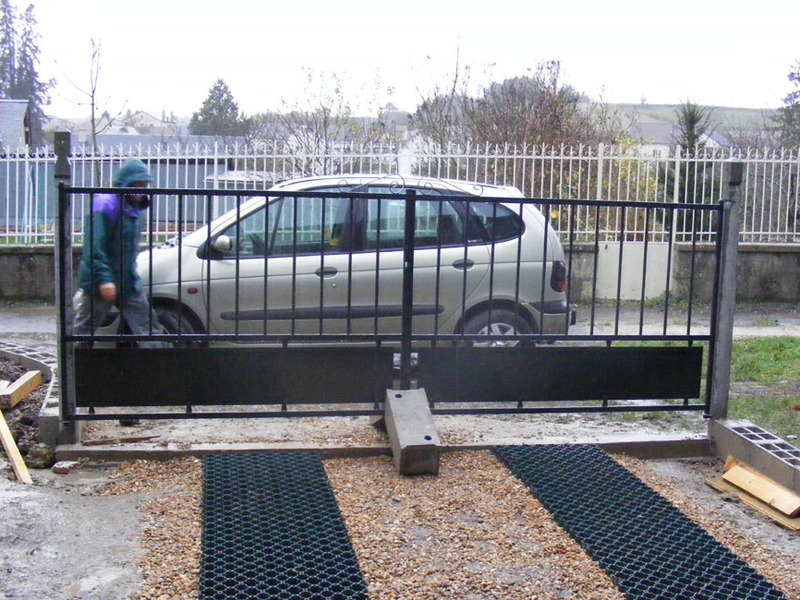 I had measured so precisely that the gates fitted perfectly - with only about 2mm between them. This was annoying as the handles and lock supplied require a 5mm gap. As there is nothing we can do to ease the gates apart we will have to work out our own method of locking the gates. none of us were enjoying the rain. The garden is slowly coming together. All(!!) 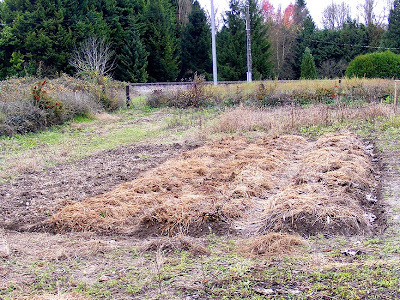 we have to do now is move lumps of soil all over the place, spread a couple of trailerloads of topsoil, plant daffodils and grass seed in the lawn section, put the fence up and move the old concrete laundry tub back. That is next week's job. I know - it sounds like a French take on Indian cuisine, but you couldn't be more wrong! Because our back garden is so small we decided that we didn't want to divide it up any more than was necessary. This meant that we either had to have a totally gravel garden (very 80's, but bleugh), or fully grassed. The latter option was voted on as better, but it left us with a problem as far as getting Célestine into the garage. 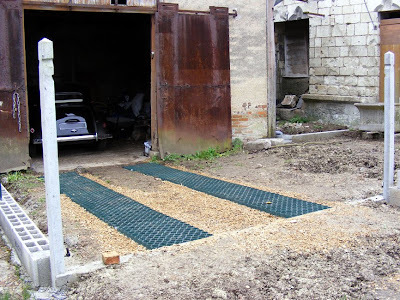 It was then I remembered the concrete stuff with a grid in it for lawn that they use in public carparks, and the plastic stuff that lawn grows through that lets you drive on a lawn without crushing it and making wheel ruts. It was then I encountered a snag: searching for "you know - that plastic stuff you can drive on that lets the lawn grow" on Google didn't help much, and until I knew the English word for it there was no way I could work out the French! Fate (or something) stepped in and by a process now forgotten but which probably involved typing "pelouse" (lawn) into Google picture search and spending an evening clicking on stuff I discovered the magic word: Dalle (or Dalles) Gazon: lawn tiles. A couple of days later we were in Chatellerault and would you believe it - a stack of plastic things with holes in the for the grass to grow through that I could point at and say " dalles gazon!!!! ", thus impressing every French person in the store. 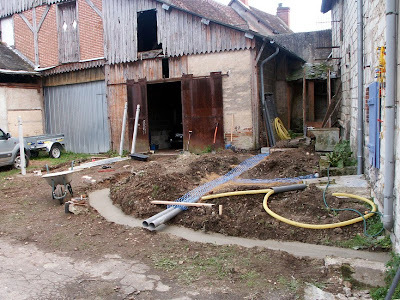 Once we were ready to start work on the back garden we returned and bought a stack of dalles gazon and 6 metres of 4mm steel rod to cut into pins so we could anchor it down. 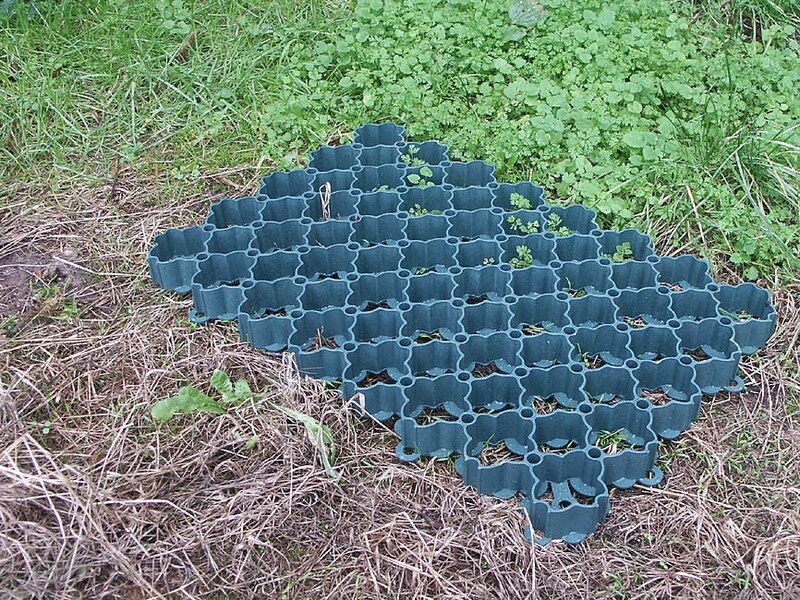 You can't just put these things on the ground and fill them up with dirt: they need to be on a firm base and anchored so that they don't shift around or sink as you drive on them. This involved driving to Yzeures with the trailer and buying a 1/2 tonne of gravier (little rounded river bed stones) as a bed to take the weight which Susan and I spread this on Tuesday afternoon. On Wednesday morning Alex arrived so we could start laying the dalles. This went really well except for the anchoring - even after sharpening a point onto the pins they required seriously intense bashing to get them into the ground - our garden substrate really is that hard. It took a couple of hours to lay the two lines of dalles from the gateway to the garage, but we are feeling encouraged by the way it feels underfoot. Of course, like most hard work things, when we are finished you won't be able to see how much work went into it, but neither should you see wheel ruts, potholes and mudholes. 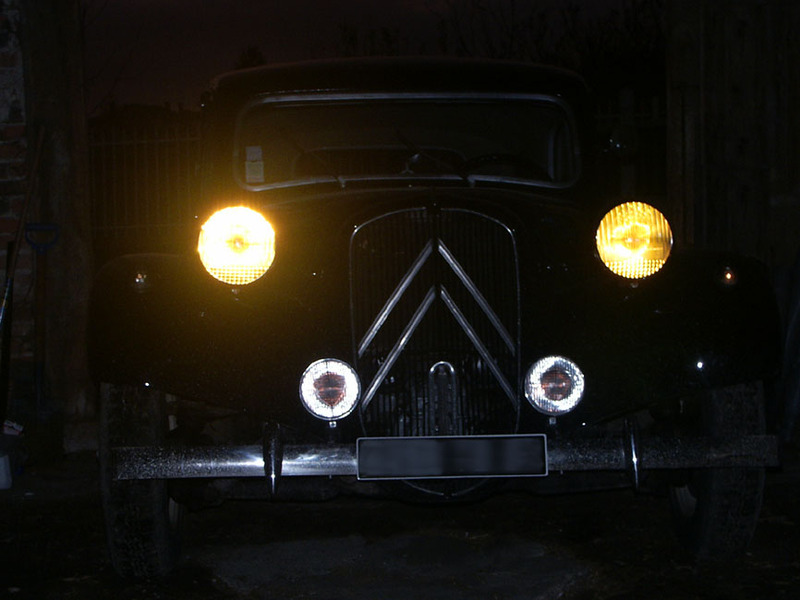 The headlights on a six volt Citroën Traction Avant are notorious (amongst Traction owners, anyway) for being a bit rubbish. One person on the Traction Avant Owners Forum even claims "last time I drove at night I swear they actually sucked in moonlight". Now we have our new alternator fitted the headlights on Célestine have improved out of sight. Or would have done, if I hadn't lost low beam the other day. On Monday I took out the old lamp (which means dismantling the headlight, which isn't difficult, just fiddly) to begin my search for a new one. 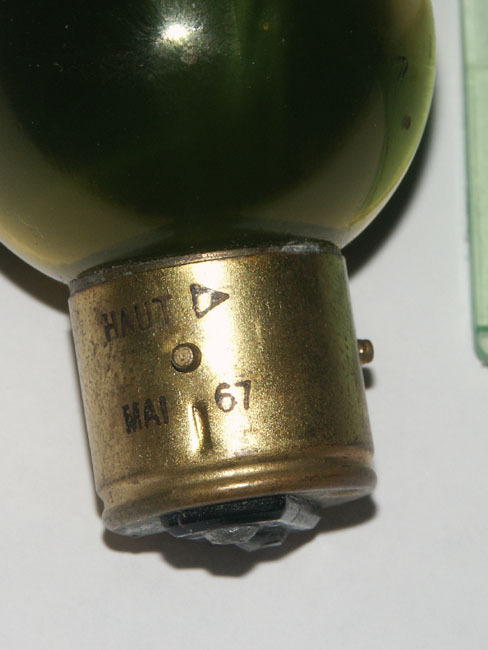 I needed the old bulb because (of course) there are 3 different sorts of fitting that were put into the Traction over the years by different factories - and on a restored car you never know what piece may have been retro fitted. 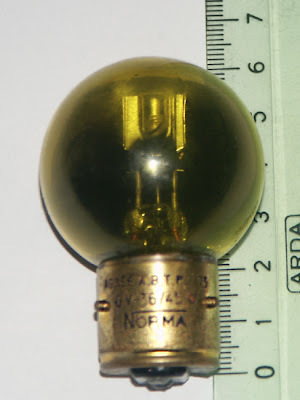 The old bulb turns out to be 36 watt low beam, 45 watt high beam with a 3 pin bayonet fitting, so that is what I am looking for. They aren't cheap - which is why I am in turmoil. 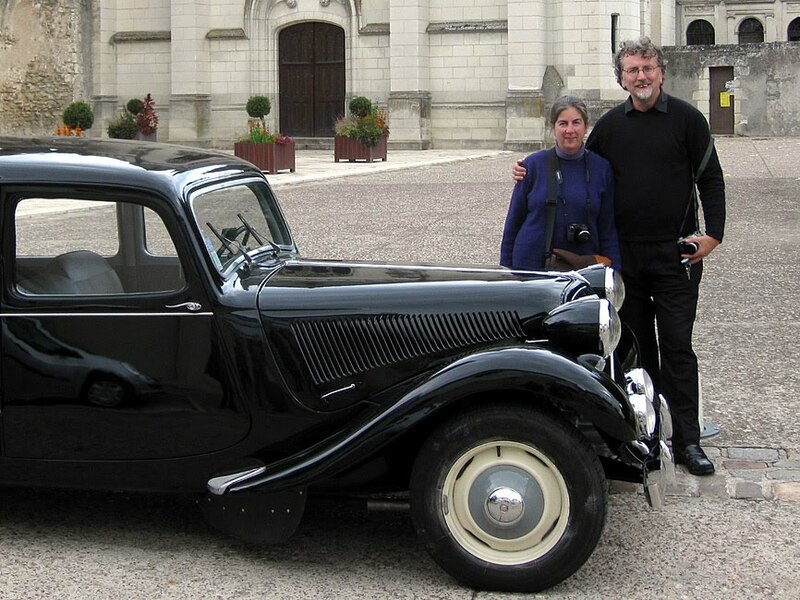 If I buy one from a Traction Avant specialist it could cost me €17, which is a bit pricey when you consider I should be carrying a spare: so I have to buy 2. I do buy a lamp, it could last a long time! In 1936 the French government were becoming increasingly concerned about Germany - in March 1936 German forces reoccupied the Rhineland in contravention of the Treaty of Versailles in which it was agreed that the Rhineland would remain a de-militarised zone. This meant that Germany and France shared a border, which made the French government nervous - they were suffering a severe financial crisis and couldn't afford a war. In response they could only really afford to do one thing: make a shedload of new laws (aren't we lucky that governments these days don't react the same way). One of the laws introduced was concerning car headlights - in future they were to be yellow so that even if they couldn't do anything about German incursions into France, at least they could tell (by headlight colour) when they were happening. This law lasted until 1992, when an amendment allowed headlights to be either yellow or white. *After I wrote this I had a period of quiet reflection and realised I had seen a headlight box somewhere. That somewhere happened to be Célestine's glovebox, and there was a new bulb in there. This means that buying a bulb isn't as immediate a concern as I thought it was, but I am glad I had this little panic. I have learnt an awful lot, but I can now do some more research and order some new bulbs at leisure. 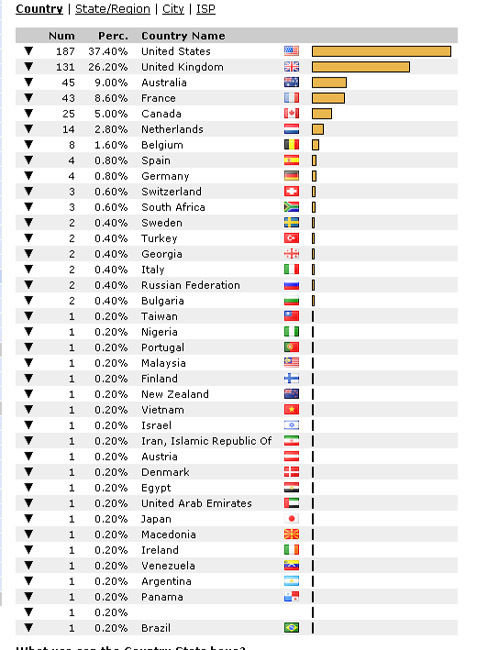 At some time today we will have our 100,000th visitor to the blog*. This is quite exciting, and has led us to do a bit of thinking about the blog and why we do it. We started the blog in August 2008 2006 as an easy way to let our families (mainly) know what we are doing without having to email them all individually at a time when we were very busy. Gradually (very gradually at first) this spread to include our friends, then people who had been searching the internet and stumbled across us. 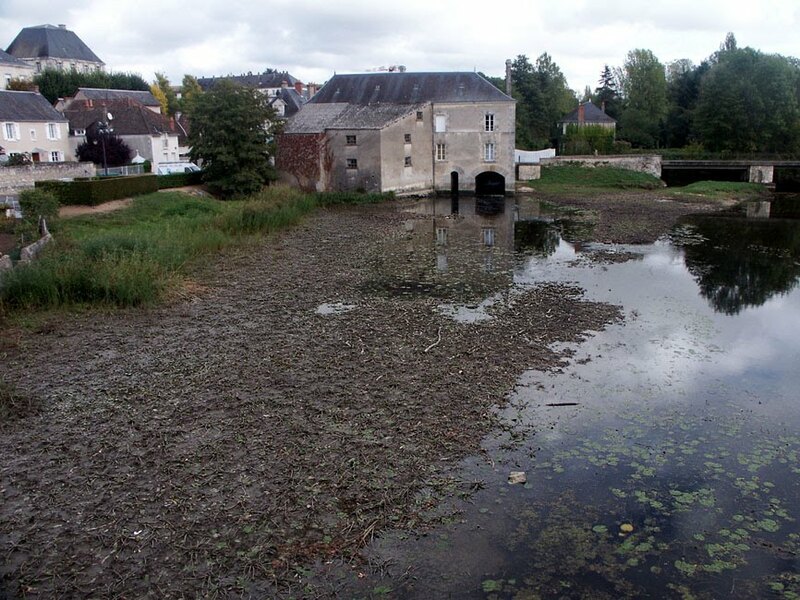 At first, that was people who had actually searched for "Preuilly sur Claise", usually people with a house in town. From there the readership has spread, mainly through links on other people's blogs, but also through people who search for information on poisonous snakes in France, feather steak, Kouign Amann or a million and one other things we have written about. We started customising the blog in January 2007. This was our first photo header. We enjoy writing the blog, although sometimes it does feel like a chore; what do you write about on days where our life, although we are living in France in an old house and own an old car, is no less mundane than anyone else's? At first we blogged only when something momentous was happening: the first post we ever wrote was the day after we paid the deposit on the house. 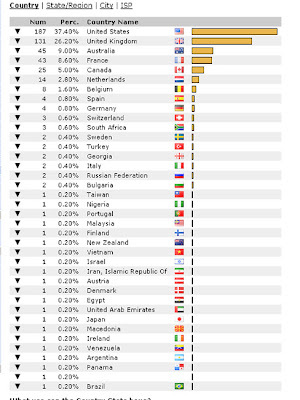 Since March 2008 we have posted every day: as a record for us of what we have done, and as a reminder of how far we have come when we are feeling like we aren't achieving. On the days where we haven't been achieving we post the cooking/touring/local colour type things - but you can't take for granted that a post about flowers means we haven't been working. If we have worked too hard, spending a couple of hours at the computer the same evening (or before 9.00am the next day) may be beyond us. The blog also give us an opportunity to share our photos. 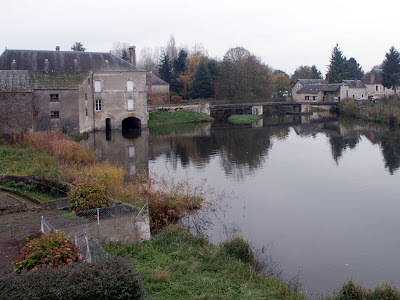 Since we bought our first digital camera in 2002 we have taken over 21,000 photos, of which 15,400 have been taken since we started looking for a house in France in January 2006. As an act of mercy we have only put 1900 of those photos on the blog. I like to have 3 photos on a blog entry (no idea why, I just decided that it made a post look balanced), so sometimes we have to make some difficult decisions about which photo we chose to show. As you can imagine, some photos have been taken many times: no matter how many times you visit Chenonceau, for instance, you can't help but try take the "classic" photo. 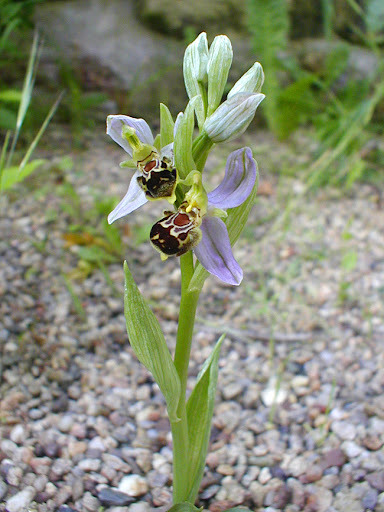 Likewise, when I see a Bee Orchid in good condition I feel obliged to take at least two shots from every possible angle. At least with digital cameras I don't have to get the photos developed and there is no financial penalty with taking so many photos beyond buying a hard drive to store them all on. This vehicle was spotted in the carpark of the sous-préfecture in Loches. 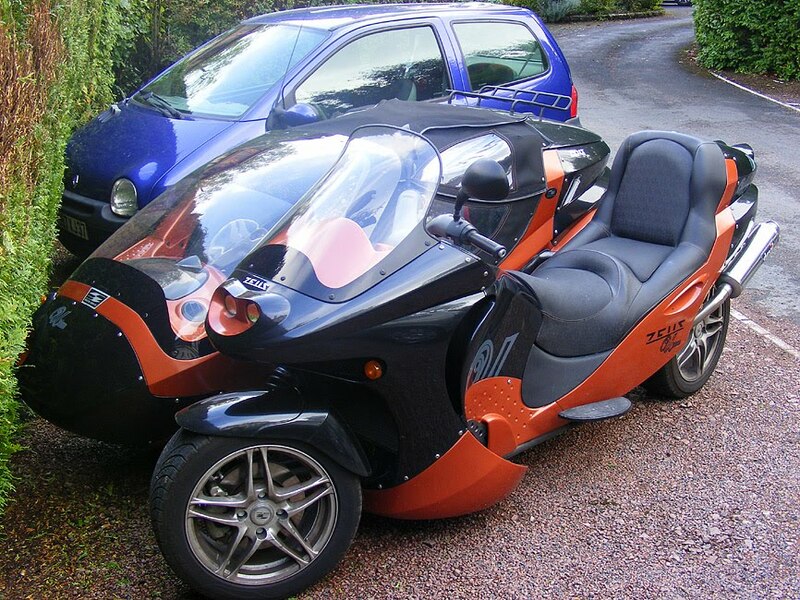 The sidecar contains two child booster seats, for children of different ages, so presumably the whole family can go about together. Why didn't they just buy a small car though? 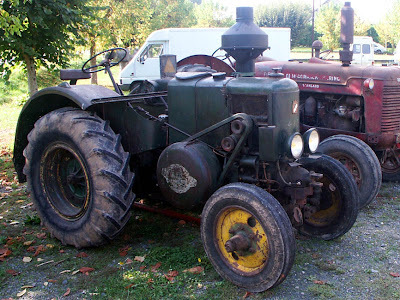 And it's nothing compared to this vehicle, posted recently on Frogsmoke, who found it on the maker's site. 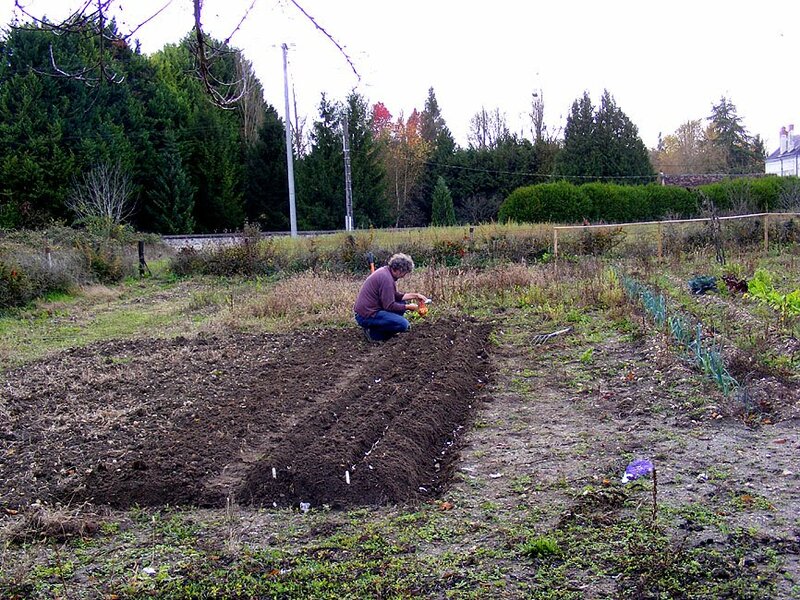 On 20 November I planted about 90 strawberry plants in the potager. 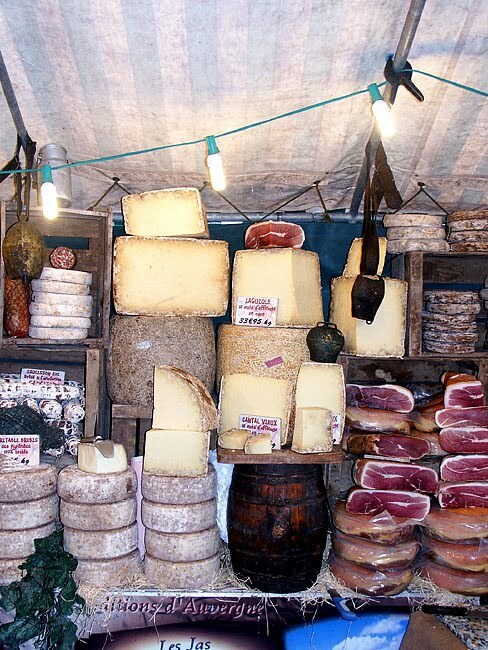 Most of them were a gift from Nicole at Les Limornières and the rest I bought for about 13c a pied* from our orchard neighbour's market stall. Simon can't understand why I planted so many and can't imagine what we will do with all the strawberries. He's also annoyed that I didn't discuss where I was going to plant them, as I have planted them in the wrong place, in a bed that was intended as part of our rotation system. They'll have to be moved in a couple of year's time anyway, when they need dividing. I have no worries about using them. They'll freeze, and I remember one summer in the 1980s, housesitting for my parents in Australia and having to deal with mountains of strawberries. Homemade strawberry icecream is a very good thing in these situations. 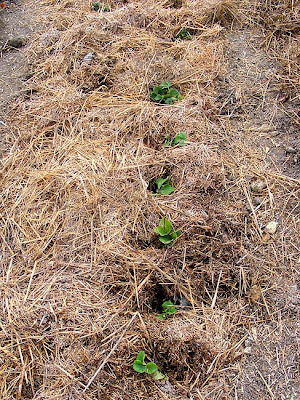 I've mulched them heavily with some of the 60 year old straw that came from our garage (ex-stable) loft. This level of mulch would harbour slugs in the summer, I am sure, but it will have rotted down a lot by then, and in the meantime, the little strawberry runners are snug and protected from the cold and can get on with establishing themselves before winter really sets in. 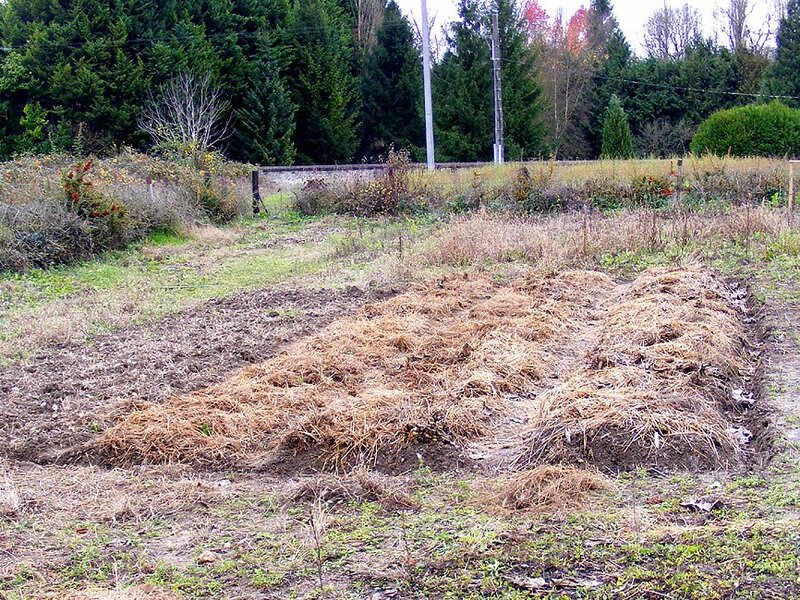 We've mulched the newly planted onion and garlic similarly, in the rows alongside the strawberries, with the idea that the new growth will be protected from frost and they will get a head start in the spring. I've also planted an autumn fruiting rasperry (Autumn Bliss), a tayberry (by far the best of the raspberry / blackberry hybrids) and a red currant (London Market). We bought these at Jardiland on the outskirts of Châtellerault. This was our first visit to a proper garden centre in France and I was impressed to find that they had tayberries, as they are not that common even in the UK where they were developed to take advantage of Scotland's relatively cool but long summer days. *literally, 'foot', but the term is used to describe small plants for planting on. Last week we had to drive to Chatellerault. 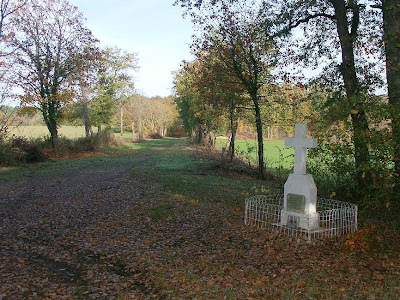 On the way we stopped where the main road crosses the avenue of trees that lead towards the chateau of Boussay (I had to stop the seat belts in the back seat rattling). 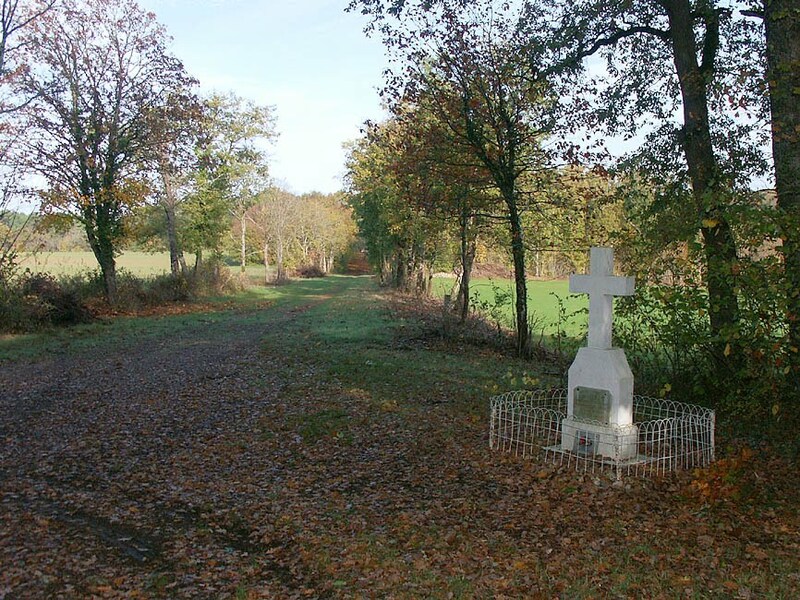 We have noticed a cross at the head of the avenue (map here) but never stopped to look at it. 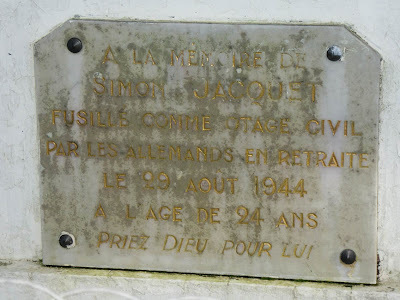 The inscription translates as "Simon Jacquet shot as a civilian hostage by the Germans during their retreat of August 29, 1944 at the age of 20 years "
We assume this ties in with the events we described when we wrote about the hostage crisis in la Roche-Posay, and it also happened the same day 3 resistance fighters were killed near Cingé. Frustratingly - but as per normal - we can find nothing about this online. 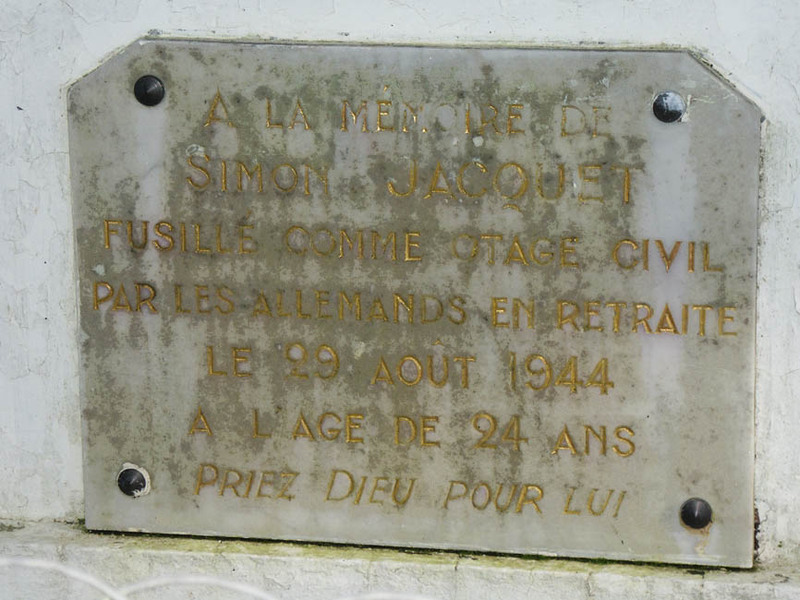 Time is fast approaching where Susan and I will have to start buying books about the resistance and the history of this area during the Second World War. How Brave are You Feeling? Yesterday I hoped my luck was in, as I came across what I was fairly sure were cêpes, and they were in perfect condition. Finding wild mushrooms that haven't got resident fly larvae munching their way through is nigh on impossible. I gathered them up and took them home to show Simon and ask how brave he was feeling. He said they looked fairly scary. I had no intention of eating them without finding out what they were anyway. Whilst I was reasonably confident they were cêpes, I knew that a few species were outstanding eating but some species were not considered worth bothering with (because they were too bitter or go unpleasantly slimy or mushy when cooked) and a couple were not very good for you at all. I decided the simplest way of finding out what they were was to take them to our chef friend Jean-Michel Chedozeau at Restaurant de l'Image. It was just after 2pm, so I knew he would probably be taking a break in the bar. Sure enough, he was there, along with his brother Christophe, their wives and a couple of customers. Jean-Michel's immediate response was to ask me if I had any neighbours I didn't like, but I wasn't fooled. He and Christophe glanced at the mushrooms and told me they were cêpes raboteux. They weren't dangereux, but they weren't worth eating either. I should have left them for the mulots (wood or field mice). They said their father had been out in the morning and got some real edible cêpes from a nearby pine forest, and told me you only get real cêpes near sapins (meaning pine). I'm now reasonably happy with the ID, but I am no expert, so could easily be wrong and Boletes certainly are a difficult group. I realised quite quickly that they weren't poisonous, because they meet the wilderness survival test: they don't have gills (they have tubes) and the flesh is white and doesn't stain when cut. (These mushrooms give an overall impression of being a rather lurid yellow, but in fact, the top is fawn, the tubes are yellow, but the flesh between the two is white.) This was all very interesting, but it's a great pity it wasn't worth whipping up an omlette. 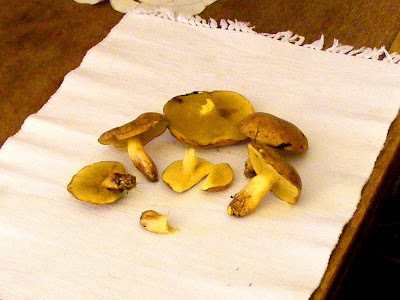 Update: I now think it is likely that these mushrooms are actually Suillus neoalbidipes / White-stemmed Bolete / Bolete à pied blanc. This means that the tiny black specks on the stem are glands, not scales (common beginners error). Having revisited the orchard today and checked where I picked them, I realise they have a clear association with the rather out of place Monterey pine Pinus radiata there . It makes me wonder if it was planted in the hopes of Edible Ceps Boletus edulis appearing. 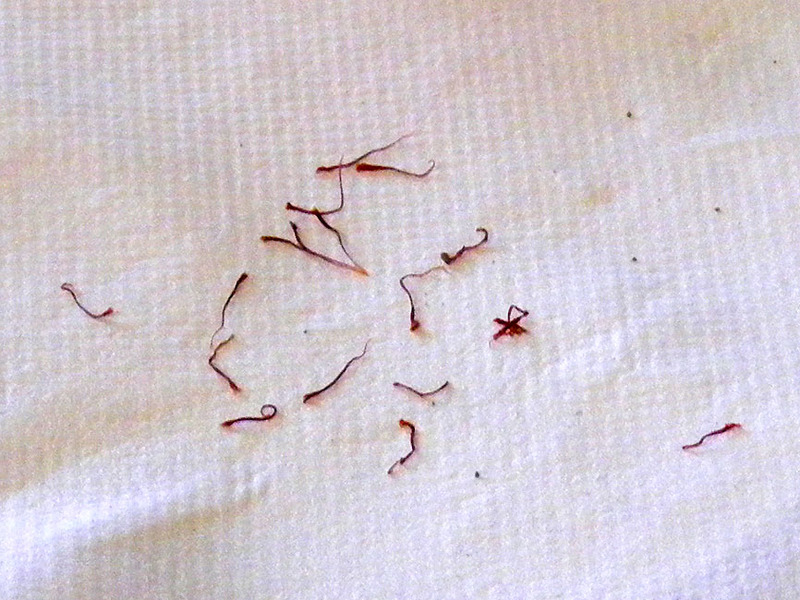 S. neoalbidipes is apparently good eating if peeled and the tubes removed. I had a little nibble and it was pleasantly mushroomy. 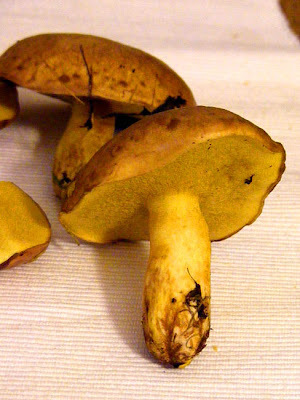 Update II: I've now had these mushrooms expertly and definitively identified and they are Weeping Bolete Suillus granulatus, edible and sometimes used in commercial mixes of wild mushrooms. Wiping the tops and removing the pores before cooking is recommended as they produce a liquid which can have a laxative effect. Susan mentioned the other day that one of the seals had come off the door of our new fire. I think I have worked out the culprit. I think it's me. We hardly ever have the fire running at full power, which means that although the wood still burns down completely, it doesn't burn quite as cleanly as it can. When we shut the fire down, we get slightly more smoke, and the glass on the door gets dirty. A period of really hot running soon burns this off, but most of the dirtying of the glass happens after we shut the fire down for overnight, and rarely do we reload the fire next morning. To keep out fire looking sparkly new, I clean the glass with a produit especially designed for the task. Unfortunately, I think I might have been using it too liberally, and it has run down the glass and dissolved the glue on the seal. the clip holding the glass onto the door. On Wednesday we bought a kit for replacing door seals, and yesterday morning I replaced the seal that had fallen off. The fact that only the seal the glass cleaner runs down onto had fallen off and all the rest are still in good condition is what first led me to think I had been overusing the cleaner. *Susan snorted (rather unkindly, I thought) when reading this sentence. The third Thursday of November is the first day you can legally sell Beaujolais Nouveau, the first wine of the new season, produced in the Burgundy area of France north of Lyon. It is a light bodied red wine, made from the grape variety Gamay. In the 1980s and 90s there was a huge marketing campaign which skyrocketed to popularity a wine that was considered rather unsophisticated by many. The party is pretty much over now, as it is widely viewed as not especially good value for money. It has to be said, though, that the prices seem completely reasonable, and some may find their way into our "drink now" cellar. 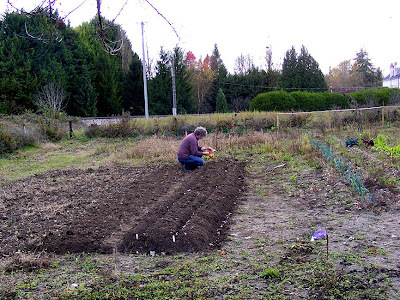 Last Saturday afternoon we planted about 70 cloves of garlic and the same of onion sets, which we hope to harvest in July next year. We are not quite sure what we are going to do with all that garlic, but the onions should be easy to use up if we can store them somewhere dry. 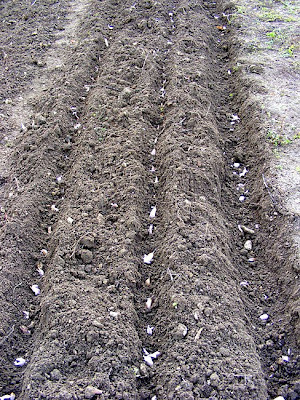 Onion sets in their trench ready to be covered. The garlic is a purple French variety called Germidour, apparently a mild flavoured soft-necked reliable performer. The onions are Stuttgarter Riesen, a round onion of the Mulhouse type (according to the label), and promises to produce sweet yellow onions that will keep moderately well. 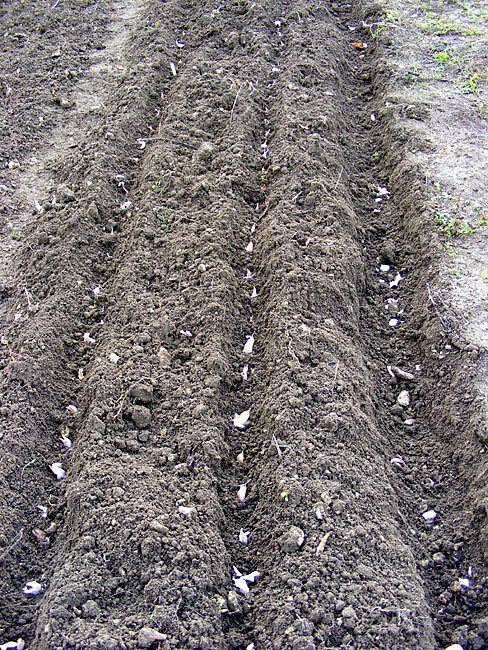 Stuttgarter Riesen is usually planted as sets ie baby onions, as they do not come true from seed. 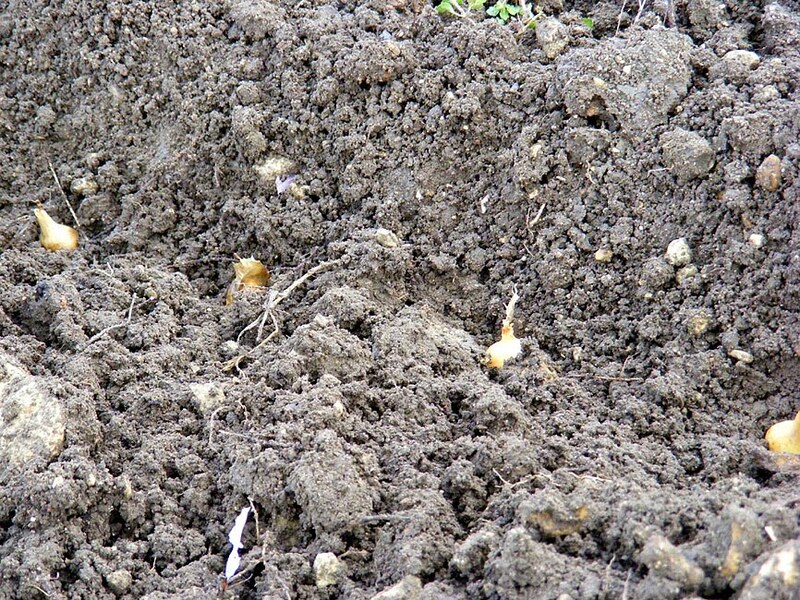 We've saved some onions to plant in March, in case a spring planting suits them better. Garlic cloves ready to be covered with soil. When I phoned my father last night, he was just on his way out to collect my mother from the hospital. She is coming home, just a week after her operation. A week ago I went down to the potager to dig fartichokes, pull carrots, beetroot and leeks and pick a bunch of parsley. 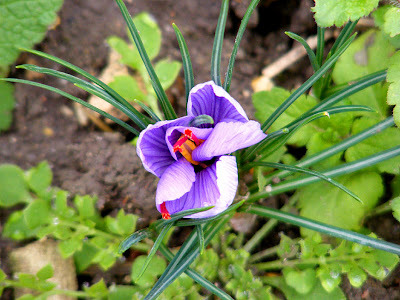 On arrival I discovered that some of the saffron was at last flowering after all. An unfurling saffron flower in our potager. I carefully picked all the flowers into a little paper cup that I happened to have in the car and took them home to dismember and dry the precious saffron strands. Saffron strands laid out to dry on kitchen paper. I think the recent rain we've had has triggered the flowering. The saffron got a little wet from the rain, so won't be top quality, but even the tiny quantity I got from half a dozen flowers will be enough to flavour a paella or a saffron cake, and I was surprised to find that I got a whiff of the iodine-like scent as I put the plate of stigmas up on the mantelpiece to dry. 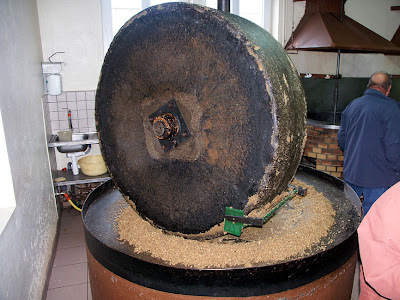 Since1810 the Lépine family have made walnut oil at Availles-en-Châtellerault, perpetuating an ancient tradition and a unique taste. Yesterday was open day at the huilerie, so even though it was raining slightly (and Simon still has the world's runniest nose) we went on a small excursion. 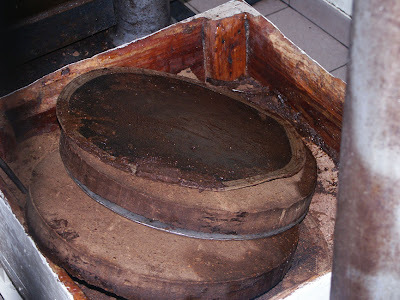 The nuts are shelled, then ground under an enormous millstone to obtain a thick paste. 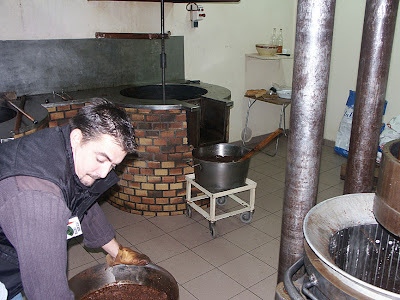 This paste goes into a pot where it is cooked just enough to go brown – a delicate stage because the art of obtaining a tasty oil depends on the cooking. The resulting gunge is then tipped into the hydraulic press, and out runs a wonderful golden coloured liquid. 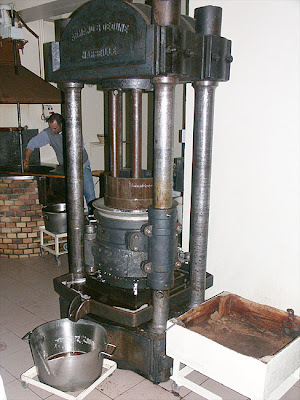 The nut cracking and shelling machines. What is left - the compact nut fibre after being pressed. Two kilograms of shelled nuts give on average a litre of oil. The oil is very aromatic and with its sweet, pleasant taste can be used with all kinds of salads, asparagus or artichokes in vinaigrette. It goes equally well with mogettes (the local, Poitevin, name for green beans). The back entrance to the château de la Boussée. The front entrance looks like this. We have been working on the back garden for a week now, and things are progressing amazingly. 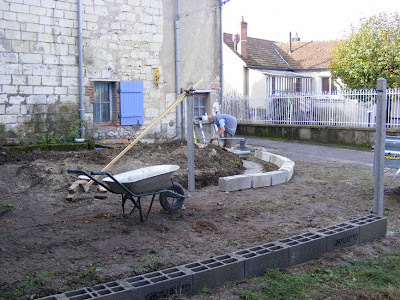 We arrived back from the Armistice 1918 ceremony to find Alex well advanced with laying the footings for the retaining wall. 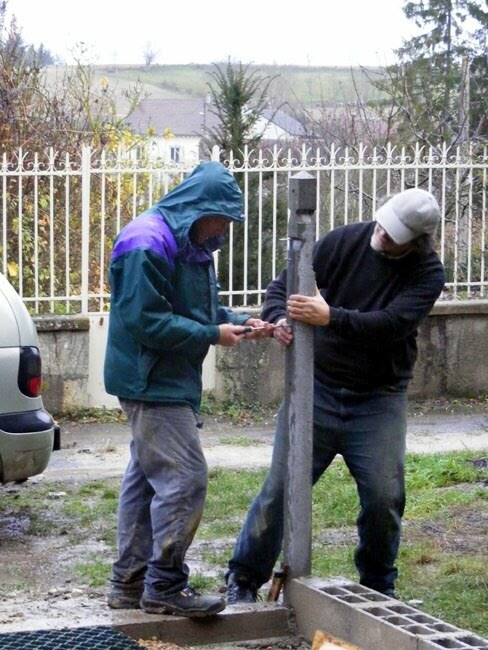 After lunch, he and I started work on where exactly the gate posts had to be in order for the gate to close properly. This took longer than you might think, but we did take as much time as was necessary to be totally confident (and then we checked, rechecked, and rechecked again). We also decided how to hang the gates, as well. The original fitting were for hammering in to stonework, and were no good for concrete posts. 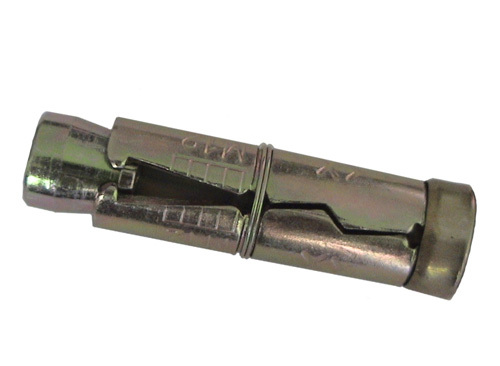 Instead, we will be manufacturing the fittings ourselves and bolting them to the posts using expansive bolts. I made this decision on Thursday (all on my own, I might add) whilst standing in Bricomarché fuming that no-one makes the right fittings for anything I want to do. Hopefully our custom made parts will be an elegant and effective solution. Yesterday morning Alex arrived with Derek, who was going to be building the retaining wall. The longer wall was quite an involved job, as it is quite a sharp curve - not easy when building with blocks 500mm (18 inches) long. to grips with laying the curved wall. 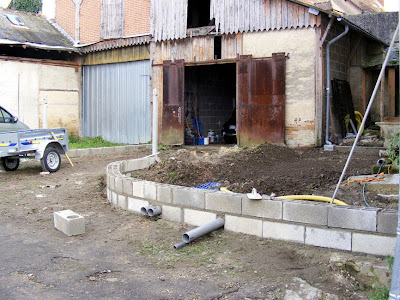 By the end of yesterday both retaining walls were in, and Susan had started work levelling the ground behind them. Our plan is for the garden to be level with the floor of the garage to it's full extent, with a little raised patio in the small alcove at the back. We wont be able to totally backfill behind the walls for a couple of days, nor will be able to hang the gates, but we are now at the stage where we can see what it is meant to be. The retaining wall finished, with the pipework in place. Once the concrete is set, the pipes will be cut flush. 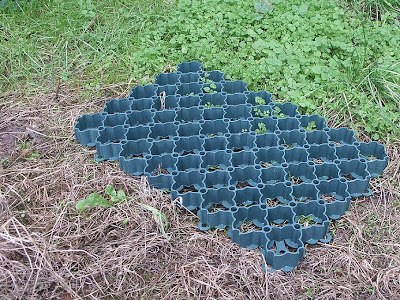 This works are temporary in order that we have a level, usable garden whilst stopping all our soil washing away and clogging up the town drains. Ultimately we hope to have the sort of garden boundary common to Preuilly: a rendered wall with fer forgé (wrought iron) railing on top as can be seen in the background of the second photo. PS, My mother had her heart valve replacement operation at 9.30am Australian time on Remembrance Day. 24 hours later she was sitting up in bed eating breakfast. They have already got her walking again, and next week she may be sent home. After a few weeks of use we realised our lovely new off-white limestone fireplace was getting spots and stains - a combination of drips from cleaning the stove door glass and ground in dirt from oak logs and burnt cinders. We began to wonder if the products we used on the tomettes were suitable for limestone. We read the labels carefully and decided that as Sarpasol is an acid, designed to remove the lime bloom from terracotta tiles, it was not appropriate; but there didn't seem to be any reason not to use the hydrofuge / oleofuge protection product. 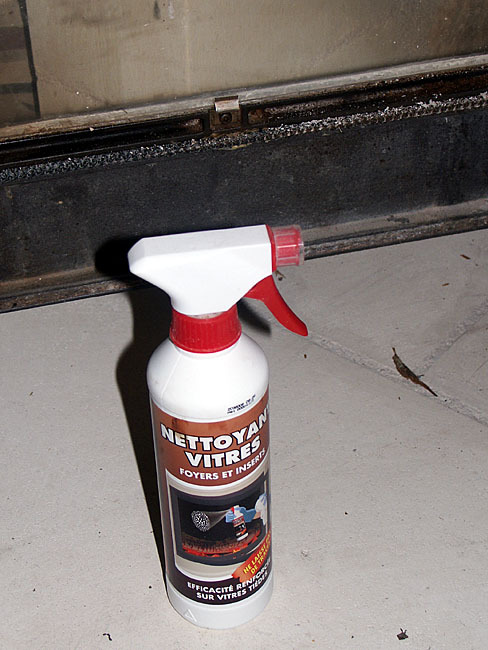 We couldn't find anyone who had used a similar product on a domestic interior, although there seems to be occasional use of water repellant compounds on the exterior of large limestone public buildings. Sanding clean the limestone fireplace. We asked Monsieur Douady what he thought. He said that if it was his, he would do nothing and let it develop patina, but he obviously knew what type of product we were talking about and agreed that there was no reason we should not use it on the fireplace. So, one morning I went over any spots and marks on the smoothly cut stone with dry 150 grade wet'n'dry sandpaper, just as I had seen Monsieur Douady after the masons left size 12 bootprints on the hearth stones. 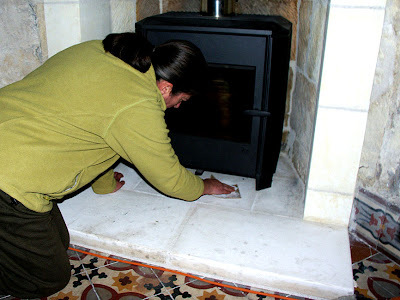 The stone is so chalky a light sanding removes all surface spotting, although nothing will safely remove deeply impregnated stains and some marks become permanent because of being 'fired' by the heat of the stove. Then I wiped off the dust with a slightly damp cloth and gave all the smooth surfaces a coat of Protecteur hydrofuge oléofuge made by Chimybat. Four hours later I gave the hearth a second coat, as it is at the most risk of staining. 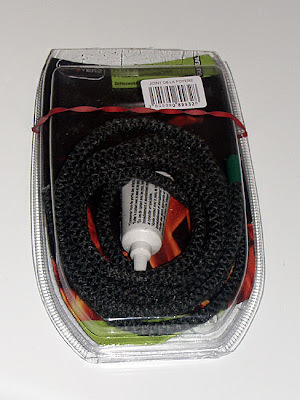 The product is very easy to apply with a paint brush, which washes out with water. It's invisible once dry and doesn't change the colour of the stone. PS Rather annoyingly, the stove itself has developed a fault, with one section of its door seal coming adrift. Up until Wednesday evening we were utterly delighted with the stove, as it heats our sitting room and the old kitchen (which is currently our office), as well as our bedroom and the shower room upstairs. It takes logs of up to 15cm diameter and 50cm long, and would burn slowly right through the night. Now, with a piece of door seal missing, it burns faster. I guess we will have to take it back to Bricomarché, where we bought it, or get in touch with the manufacturer, Invicta, and get a new door. I certainly hope this will be covered by some sort of guarantee. Yesterday was Armistice Day: 91 years from the signing of the Treaty of Versailles which ended the First Wold War on 11 November 1918. In France the day is known as Armistice 1918, and is a public holiday. 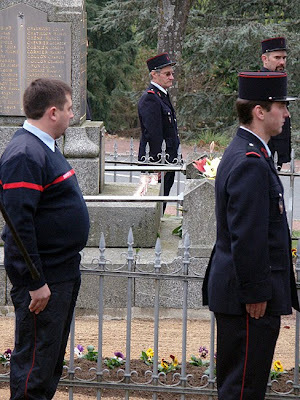 This is the first time we have been in France on Armistice Day, and although we hadn't seen any notices about a ceremony, we assumed there must be one. We went to the Mairie at 10.30, and Susan's intuition paid off - the ceremony was just getting underway. We had just enough time to donate some coins to the Veterans Association - for which in return we received little sticky lapel badge - and the first drum-roll and fanfare of the day started. This was followed by the Marseillaise, and then all those in attendance marched behind the flags to the War Memorial. At the War Memorial the ceremony would have been fairly familiar to anyone who had attended a similar service in any country - a speech about peace in Europe, the laying of wreaths and the lowering of flags. What we hadn't seen before was the lighting of candles and the placing of them on the memorial by the children of the town. From the War Memorial we all marched back through town to the cemetery. 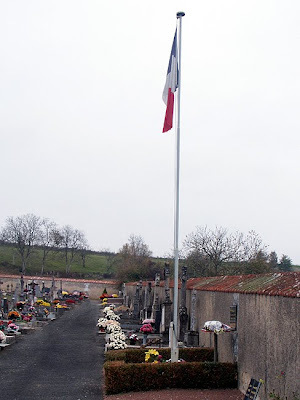 Preuilly-sur-Claise's cemetery doubles as a military cemetery. There, more candles were lit, but this time placed on the graves of the First World War dead. 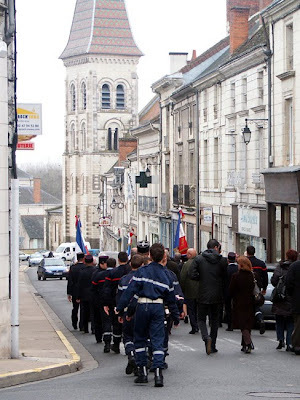 After the cemetery, the procession went back to the Mairie. A final Marseillaise, and the invitation was issued to all citizens of Preuilly to join the Maire for an apéro. Susan and I missed the drinks, as we had Alex working on the garden. Alex arrived yesterday morning to start building work in the garden. We are putting in retaining walls and drainage, gates and a fence. At the top of the garden (by what we assume were the long drops) we are having another terrace for refined outside dining. showing our stuff being delivered. We spent ages getting our levels right - the ground is deceptively uneven in places - i.e. where you don't expect it to be - yet surprisingly level in places where it looks sloping. Once this was done, we decided how high the footings for the retaining walls should be. We managed to drive in some pegs, even though the "soil" is equal parts cobbles, flint, and degraded limestone clay. Alex then dug out the channels where the pipes will be that take the water from our downpipes. These will eventually emerge at the base of the retaining walls, hopefully directing rainwater away from the walls of the house. Getting the levels for these wasn't easy (for all the same reasons as getting the levels right for the wall footings was difficult). The trenches we had dug by bobcat on Saturday were ever so slightly in the wrong place; using them would have meant the gates wouldn't have shut overlapped by about 40cm - which would have been many things, peeving included. This meant I had to get into the trench with a mattock and finesse things (no photos taken, but even Susan will say it's true). Once Alex had left, Susan and I went to Bricomarché in Yzeures and bought 25 metres of agricultural drain. 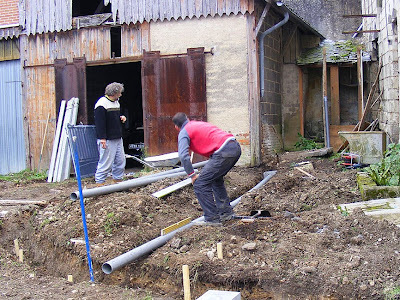 This means that the new soil level shouldn't mean an increase of dampness in the walls - we will be laying the drain along the wall of the house, as well as along the foot of the retaining wall for the terrace. 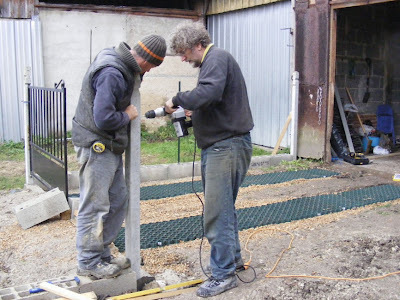 Things are looking good - as long as we can get the gate posts in the right place and the gates hung properly I think the job will be a good 'un. That gets done tomorrow, but before that Susan and I are off to investigate what is happening in town for Remembrance Day (Armistice 1918, in French). Our banner today is in rememberance of the events of 1914 - 1918. On a different note completely, my mother had her heart valve replacement operation today (Australian time). She will be off her feet for quite some time, so we had better make the blog posts interesting for a while!! Yesterday the materials arrived for amenaging our back garden; two bags of sand , one of gravel, some cement and concrete posts. Because everyone has seen sand and gravel before, some pictures of a tractor taken at the Art 'n Lard Festival last month in le Petit Pressigny. 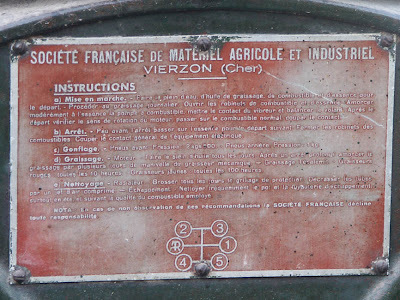 Société Française de Vierzon was building machinery for about 100 years until the 1960s. 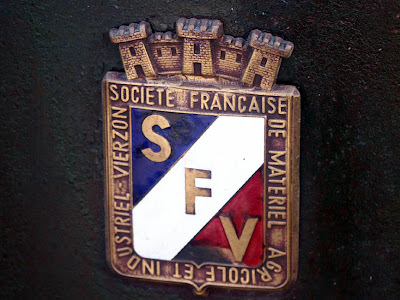 Vierzon is quite local to us, so I am sort of surprised I haven't encountered these machines before. written on it before. It's not a bad idea though. Tomorrow we should have more to report on the work in our back garden. 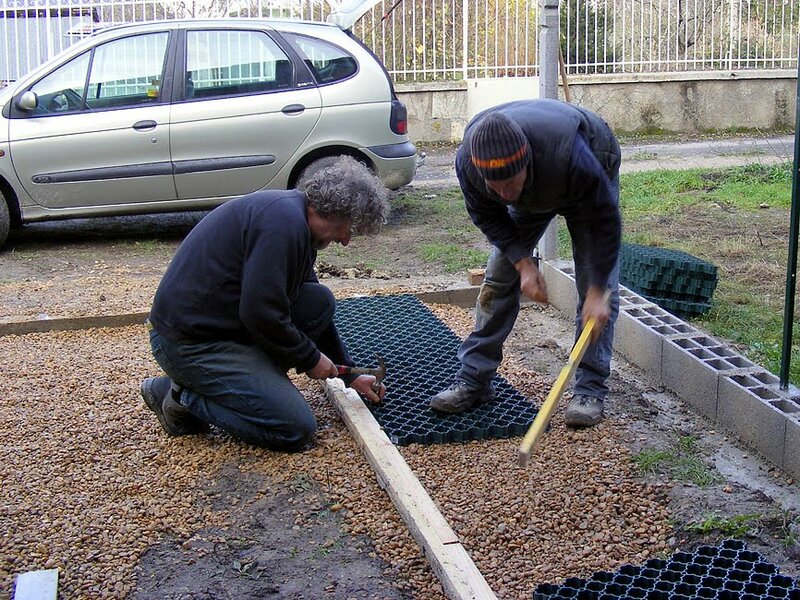 This morning I hope to be hiring and using a packer plate (whakerpacker in some territories) to compress the gravel for laying cobblestones on the front courtyard. That could be fun! ps You may be one of those people who Google have included in their "This page has been intentionally left blank" experiment. If you find as frustratingly pointless and stupid as I do and are using Firefox, mail me and I will give instructions how to disable it. If you have no idea what I am talking about, lucky you.